Sophia Loren as Carmela in La bella mugnaia - The Miller's Beautiful Wife, released in October, 1955. Sophia Loren is perhaps the best-known movie star of Italian birth — ever. A great beauty, combined with a passionate personality, Loren rose from relative obscurity to become a highly regarded acting professional, known to millions around the world. Sofia's father, Riccardo, was an engineer of noble lineage, and so refused to marry her mother, Romilda, with whom he fathered two more children. Sofia and her mother and siblings went to live with Romilda's mother in Pozzuoli, near Naples. During World War II, Sofia was struck by shrapnel during an Allied boming raid. With the Italian liberation, the family set up a saloon serving homemade cherry liquor. Mother played piano, and young Sofia waited table; it was very popular with American G.I.'s. At age 14, Sofia entered a beauty contest, and although she did not become Miss Italia 1950, she enjoyed the experience. Hanging around the Cinecittá studio in Rome, she got extra work as Deborah Kerr's slave in Quo Vadis (released in November, 1951). This was followed by several more extra type film credits. Her first film as Sophia Loren was La domenica della buona gente - Good People's Sunday (released in January, 1953). A film of the Vedri opera Aida was being prepared with soprano Renata Tebaldi in the title role, with all the recordings made, when the singer decided to quit. Loren took on the part at short notice. Aida (released in October, 1953), did good business, and Loren got good notices for her performance. Loren achieved stardom with director Vittorio De Sica's L'oro di Napoli - The Gold of Naples (released in December,1954). She was teamed with Marcello Mastroianni in Peccato che sia una canaglia - Too Bad She's Bad (released in January, 1955), and starred with him again in La Bella Mugnaia - The Miller's Beautiful Wife (released in October, 1955). Loren attracted the notice of Hollywood, then making a number of films in Europe. Her first Hollywood films were Boy on a Dolphin (which played the Chinese in April, 1956), and The Pride and the Passion (released in July, 1957). Signed to a contract at Paramount, Loren starred in Desire Under the Elms (released in March, 1958), Houseboat (released in November, 1958), with Cary Grant, and Heller in Pink Tights (released in January, 1960) with Anthony Quinn. Another memorable film was It Started in Naples (released in August, 1960), with Clark Gable. In 1960, Loren returned to Italy with director Vittorio De Sica for La ciociara - Two Women (released in December, 1960), which became an international hit, earning Loren the Best Actress Oscar, as well as best actress at the Cannes Festival. Now, producers were beating a path to Loren's door. She entered the epic genre with El Cid (released in October, 1961), then went back to De Sica and Mastroianni in Ieri oggi domani - Yesterday, Today and Tomorrow (released in December, 1963), produced by her husband, Calo Ponti. With her career at its peak, Loren commanded a whopping $1 million to appear in The Fall of the Roman Empire (released in March, 1964). Then, she went back to her Italy / De Sica / Mastroianni combo for Matrimonio all'italiana - Marriage Italian-Style (released in December, 1964). Her last film before taking a break for three years to have two boys was Charles Chaplin's final film, A Countess from Hong Kong (released in January, 1967), with Marlon Brando. 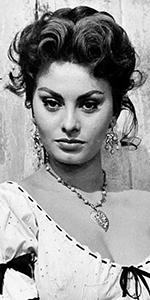 After her break from the cameras, Loren returned to a very busy schedule: the Hollywood musical Man of La Mancha (released in December, 1972), with Peter O'Toole, then, back to Italy and De Sica for Il viaggio - The Voyage (released in March, 1974), with Richard Burton, Brief Encounter, aired over NBC in November, 1974, also with Richard Burton, and led the cast in husband Ponti's production of The Cassandra Crossing (released in December, 1976). Loren made another picture with Marchello Mastroianni — a period picture this time, Una giornata particolare - A Special Day (released in May, 1977), and did the action picture Brass Target (released in December 1978). Loren published her autobiography, Sophia Loren: Living and Loving, Her Own Story in 1980, which became the basis for the television movie version Sophia Loren: Her Own Story, aired on NBC in October, 1980, where she was able to play herself! Loren was awarded an Honorary Oscar in 1991. She presented an Honorary Oscar to director Federico Fellini in 1993. Loren did very few films from this point, but appeared in Robert Altman's Prêt-á-Porter - Ready to Wear (released in December, 1994), while Grumpier Old Men (released in December, 1995) was her biggest U.S. hit in years. Son Edoardo directed his mother in Between Strangers (released in August, 2002), and Loren also did the television miniseries Lives of the Saints, aired over CTV, in January, 2005. Five years later, she accepted a role in the musical remake of Fellini's Otto e mezzo, Nine (released in December, 2009). In 2004, Loren's sister Maria had written a memior about her childhood in Pozzuoli, which had become popular. Loren starred as her mother in the Italian television movie version, La mia casa é piena di specchi - My House is Full of Mirrors, aired over RAI in March, 2010. Loren has lived for the past several years in Geneva, Switzerland. Grauman's Chinese Theatre, Hollywood, California. Sophia Loren Forecourt ceremony, Thursday, July 26, 1962. 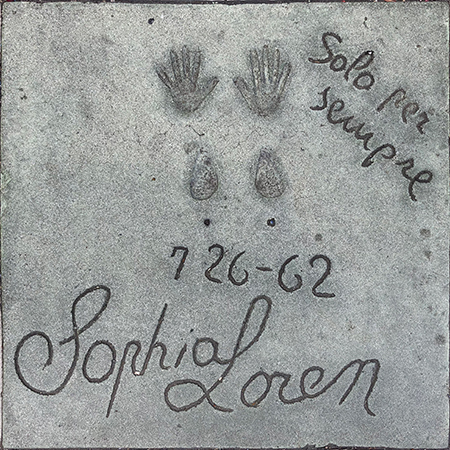 Sophia Loren begins with placing her hands in the cement.